How to Write a Paper on the Fourth Industrial Revolution? The Fourth Industrial Revolution: How to Write About It? This is a new concept invented by Klaus Schwab. Whether you believe in it or not, it is undeniable that the advances in technology are transforming the world at an incredible pace. Here you will learn how to write about it and what things to emphasize in your essay; or get a custom essay with us. Even though all four revolutions brought various changes, the feelings they provoked were very similar. Let’s take a look at the First Industrial Revolution. It did not only transform the world economy and humanity overall in most staggering ways, but it also produced much misery for households all around the world. The problem with the First industrial revolution was that it came totally unexpected and provoked a change too rapid to be controlled. Thus, people were unprepared for the new reality they were forced to face. Many lost their jobs and their minds. The first revolution brought income inequality and environmental pollution. It was the precursor of almost all the problems we are currently dealing with. Cities exploded before the adequate sanitations systems were installed, new technology was implemented and people sacked before they could gain new skills to find another employment. Of course, there were many positive aspects of this first revolution like the formation of trade unions, but the negative influence was more prominent. Therefore, in the context of yet another revolution we need to be more cautious and civilized about our transition towards new technology and ultimately the brand new world. Before you discuss the Fourth industrial revolution, its dangers and possible impacts, it’s important to understand what it really is. Basically, it’s first and foremost the technological change which is bound to reshape humanity. If you want to get a glimpse of what it may look like, I recommend watching the first season of the TV show Black Mirror. Technology already plays a vital role in today’s world. However, with the new revolution it can become completely integrated not only in people’s daily activities, but also in their bodies. It can become even more powerful and influential than it is now and even get a mind of its own – see strong AI. It has a potential to turn the world into a utopia or dystopia. Let me explain why. Let’s start with the good news. The Fourth industrial revolution can potentially end hunger and supply problems ending capitalism as we know it. It can be achieved because the new technology may bring abundance and when the resources are not scarce, there is no need to fight for them. Humanity could eventually achieve peace and prosperity. However, this is a utopian vision of the possible effects. There are quite opposite opinions circulating in the scientific circles. One of the most drastic one is that this revolution may end humanity and the planet Earth. It comes down to the idea that people are irrational and when given unlimited technological power, they may use it to destroy their enemies which will trigger the third world war and the true apocalypse. There are also moderate views which revolve around the relationship between people and technology. Everybody is to some extent addicted to technology. Whether you are a gamer or cannot live without your Fitbit, you, probably, cannot imagine your life without certain technological benefits. However, what if you had an opportunity to install a microchip into your brain which would not only save all your memories, but also provide access to the unlimited storage of information? Even though it may sound far-fetched now, but just imagine a Victorian man being handed a modern mobile device. I think you understand what I am getting at. Scientists and engineers are already working on this possibility, so it may not be as far into the future as you may assume. It is hard to judge what kind of effect this overreliance on technology could have on the human brain and its major functions like memory, movement and feeling. However, considering the fact that technology already has a very adverse impact on people’s intelligence, the picture is very grim indeed. When talking about the societal changes, it is important to see the subtle differences between the way men, women and transgender are going to fare. It is predicted that the Fourth industrial revolution will either destroy or further cement gender inequality. The fact of the matter is that women are still employed in most of the low-skilled and low-paying jobs around the world. For instance, in Asian textile factories it is mostly the women that constitute 9 million working force. Therefore, if they are substituted by robots, they will either become unemployed, or get into a very precarious position. Many employers will use this fear of getting fired as an opportunity to lower wages even more or hire women unofficially, without any social benefits. Even in the developed countries only one out of 7 women with a STEM degree works in the field. Many are either facing difficulty entering the industry or have to give it up to look for more family-friendly environments. It also does not help that women in many countries are still encouraged to sacrifice their careers for the sake of family. So, in case of the Fourth industrial revolution, women will be hit the hardest because many still have fewer competitive advantages than men. It is probably impossible to talk about the Fourth industrial revolution without mentioning AI. AI has been at the forefront of people’s attention for the past couple years with amazing inventions such as robot Sophia. These topics for essay writing are most challenging and interesting. AI is a very delicate kind of technology. It is critical to give it a clear, but nuanced objective, because AI is just that – a machine. It will not understand that if you ask it to bring you a cup of tea, and there is a person using a teapot, there is no need to wait for that person to be done. AI may simply push the stranger away to fulfill its mission. If such a minor action can cause so much upheaval, just imagine what might happen if AI lands in the wrong hands. AI has such a destructive potential that the whole planet may end up wiped up in no time at all if some aggressive leader decides to unleash the war. Of course, one should not engage in fear mongering, as it is important to look at the situation from a reasonable perspective. 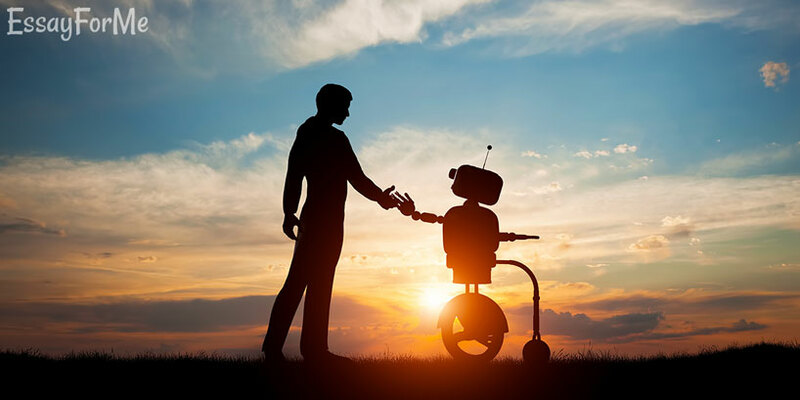 It is true that AI can be very dangerous, and the Fourth industrial revolution may cause massive unemployment and people’s disconnectedness from reality. However, this is not a reason to try and stop it – people just need to be careful about their actions. Nuclear power is also scary, but up until now humanity persevered. It means that people are not as irrational as many are tempted to believe. The survival instinct is still within them, which means that they will do everything to prevent the world from ending. So, even though there are plenty of reasons to fear the upcoming revolution, there are also many reasons to be excited about it. Technology enables people to have more free time and engage in creative activities rather than humdrum labor. Thanks to technology more people now have access to education and medical care. So, upon the whole the Fourth industrial revolution is very promising when handled in the right way.